There wasn’t any doubt that Issaquah Eagles senior pitcher Tyler Odegard would be on the hill in the top of the seventh inning with a two-run lead against the Inglemoor Vikings. Odegard, who had surrendered just one hit in the first six innings of play, enticed Inglemoor into three consecutive fly-ball outs in the top of the seventh, preserving an Eagles 2-0 victory against the Vikings on April 12 in Issaquah. Issaquah improved its overall record to 9-5 with the win while Inglemoor dropped to 10-4. The game between the 4A KingCo powerhouses was scoreless until the bottom of the fifth. 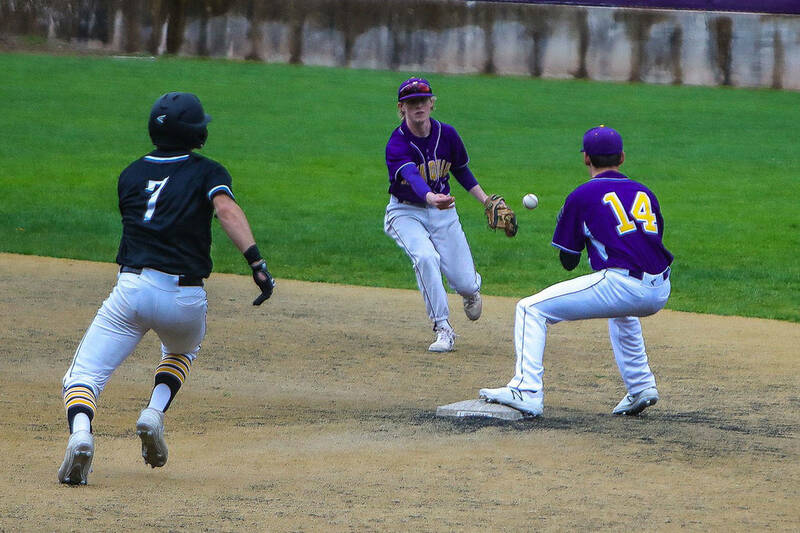 Issaquah junior catcher Colton Willbrandt connected on a RBI double to right field scoring Ryan Baker from second base, giving Issaquah a 1-0 lead. Baker pointed toward Willbrandt at second base with emotion after crossing the plate. Later in the inning, Willbrandt scored on an Inglemoor error, extending the lead to 2-0. In the top of the sixth, Inglemoor loaded the bases but Odegard enticed Vikings’ batter Eunsang Yu to ground out into a double play to quell the threat. The Eagles intentionally walked Inglemoor star player Sean Mulcare on the previous at-bat, which loaded the bases with Yu at the plate. Issaquah head coach Rob Reese was glad to see their strategy work to perfection. “It was do or die there because I think Mulcare is the best hitter in the league. The guy (Yu) we ended up facing is one of the top hitters in the league also. We were just hoping he would hit it on the ground and he did. It was exactly what we wanted. It doesn’t happen too often but it happened right there,” Reese said. Odegard credited shortstop Tyler Reese for making a bevy of clutch plays throughout the duration of the game. The double play in the top of the sixth turned by Reese and second baseman Joseph DePalo was pivotal. “Tyler did a great job on that. That was a big play for us. He did great all game,” Odegard said. The victory was monumental for the Eagles considering both teams are near the top of the 4A KingCo standings. “If we had lost to them, they would had gotten the tiebreaker. They are a great hitting team. Odegard had a rough night the other night and bounced back today with a one-hit shutout. He was just awesome,” Reese said of Odegard. Odegard said Willbrandt is the unsung hero behind the plate for the Eagles. The junior catcher is adept at decision making behind the dish. “Colton did most of the work. He called the game and framed every ball. We have a great catcher,” Odegard said.